As the sun sets on the Santa Catalina Mountains, look to the sky. The mixture of incendiary reds, bright blues, varied shades of yellow, orange, and gold is different in its composition each day. 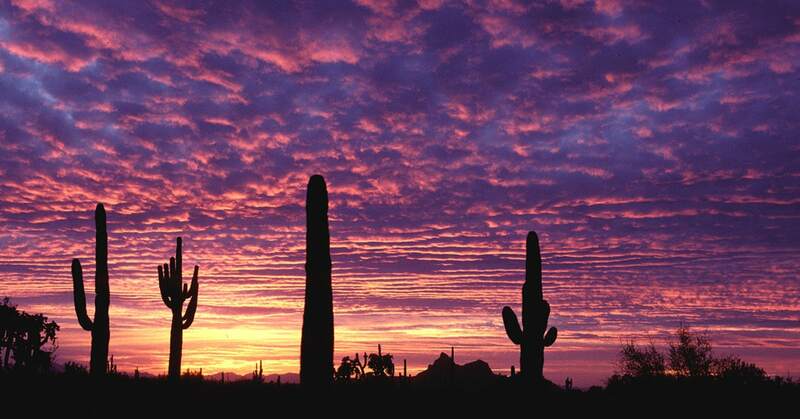 When it all comes together, the Arizona sunset serves as inspiration for artists of all mediums. When designing your home, let the sunset be your palette guide. Terra cotta, red, and orange tiles can be representative of the sun that bathes our state, the clay and soil of our desert landscape, and the ascending foothills and steep peaks of our mountain ranges. These can be especially effective in evoking atmosphere in a kitchen, living room or bathroom via mosaic patterns or tiled wall borders. In Southwestern design, varied shades of blue are often associated with serenity, tranquility, and peace. By incorporating different blues into your space via walls, accessories, or displayed artwork, you can pay homage to the vast and expansive Southwestern sky before the sun sets while simultaneously lending a sense of calm to your space. Turquoise—a mineral that is widely mined across the Southwest—is commonly used in jewelry, artwork, and could be the perfect accent to any home edition. Just before the sun fully escapes to the west, she paints the mountains in bluish purple—a vibrant invitation to chase the horizon. By incorporating these shades into your home design—maybe your front door or a bedroom wall—you can capture the same magic of an Arizona sunset.